Army Wife Post: Day Two Hundred Seventy-Seven. Can you see the little face in there?! Too cute! 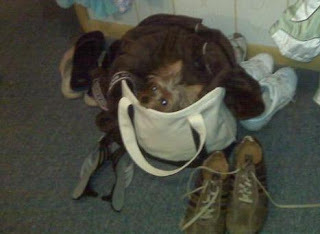 She doesn't want to be left behind! So sweet! I love it! Poor thing thinks you are going to leave her behind again! this pic put a HUGE smile on my face just now!! Ha ha! My cat gets in my suitcase every single time I pull it out. Jordan said he pooped on the carpet the other day. It's so crazy how worked up they get about us leaving! Awww she is so cute and smart. Oh, So cute! I cracked up about the comment you left on my blog about having to carry her while you ran:p I can't wait until Bella is strong enough to run with me:p Hopefully she doesn't hate it! That is so cute! When we're packing for vacation our dogs get clingy too. Isn't funny how dogs can just sense when you're going somewhere?